Danica Patrick is driving the No. 10 Ford Warriors in Pink Fusion race car this weekend in the Monster Energy NASCAR Cup Apache Warrior 400 at Dover International Speedway. 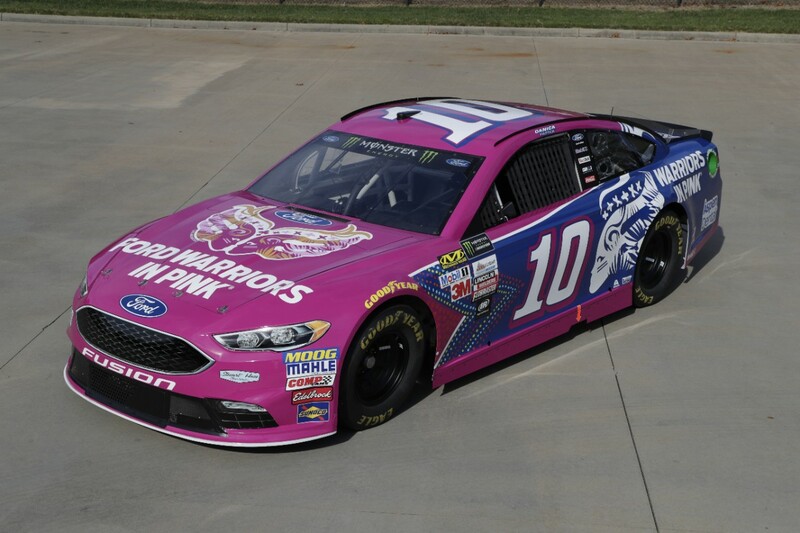 The debut of the special Warriors in Pink livery for Sunday’s race comes just in time for Breast Cancer Awareness month, and marks Ford’s decades-long commitment to raising awareness and funds in the fight against the disease. Patrick will take to the track again with the Warriors in Pink Fusion Oct. 8 for the Bank of America 500 at Charlotte Motor Speedway. Patrick’s No. 10 race car displays the warrior symbol to honor the powerful, courageous women and men engaged in the fight against breast cancer. Symbols are a key part of the inspirational message Ford Warriors in Pink represents – serving to uplift those who exhibit strength and courage in the face of their greatest battle. “The Ford Warriors in Pink race car really looks great,” said Patrick, one of the most successful women in the history of motorsports now driving for Stewart-Haas Racing. “Cancer impacts all of us. I bet there are very few people out there who don’t know someone impacted by breast cancer. My friend had a double mastectomy as a preemptive strike because she actually tested positive for the breast cancer gene. She went through everything and hopefully avoided it, but it hit close to home. As a preview to marking Breast Cancer Awareness month, Patrick helped kick things off with Ford Warriors in Pink by surprising patients with racing lessons at Chicagoland Speedway Sept. 20. These special events being held across the country are designed to help tap into a newfound fearlessness patients and survivors tend to experience by giving them free access to engage in new thrills and challenges. To empower people to take action and support their loved ones, Ford Warriors in Pink launched its More Good Days initiative in 2015. Since then, the program has delivered more than 80,000 More Good Days experiences across the country – ranging from rides to treatment centers to special patient surprises including racing lessons and more. Ford Warriors in Pink has been unrelenting for 23 years working to help breast cancer patients and their families. To date, Ford has dedicated more than $133 million to research, education and patient resources. To join Danica Patrick and Ford Warriors in Pink in the fight against breast cancer, please visit FordCares.com to access free tips, tools and resources that make it easy to give breast cancer patients More Good Days.